As we begin another semester and a new year, we reflect on our accomplishments and set new goals. We have a lot to be proud of – and a lot of work that still needs to be done. We take pride in these recognitions. However, we know that none of it would be possible without the support of our alumni and partners. With your support, we are able to provide additional assistance in the form of endowed professorships and fellowships, as well as in scholarships and professionalism training. It is programs such as these that help us recruit, retain and develop the highest-quality student body and faculty. Whether you want to contribute your ideas, talents, time or resources, there are many ways you can get involved with the SIU College of Business. We are looking for people who are willing to share their professional experience with our students through a new mentoring program, or through our successful internship and externship programs. We have advisory boards that support each department and our Office of Minority Affairs. Our students come from urban and small-town settings, including students from diverse and underrepresented populations. Many can only make completing their business degrees a reality through your contributions to our scholarships. All of our students will be entering a competitive job market when they graduate. Training in etiquette and professionalism is no longer considered an advantage, but a requirement for their employability. We maintain a culture of dedicated scholars who teach across three degree programs: undergraduate, graduate and Ph.D. To attract, recognize and retain the very best faculty, we use endowments established by donors through the SIU Foundation. We use endowed professorships, fellowships and chair positions to help us maintain a healthy student-to-faculty ratio and to recognize our outstanding faculty. At the College of Business, we hold ourselves to the highest standard of integrity and accountability, combined with a passionate commitment to change lives and transform business. You are an important part of our mission. Thank you for staying connected. 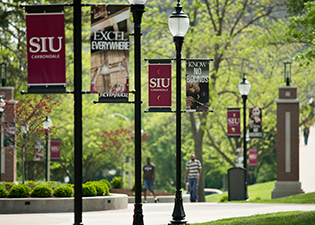 To learn more about ways you can support our college, and to help us improve and enhance the business education we provide through scholarships, service or contributions, please contact Jill Gobert at jillg@foundation.siu.edu or visit business.siu.edu/contributors.